If you’re a mom (especially a young mom) who is feeling like you don’t have enough time in your day, head over to my post on MomLife today for a simple tip that has helped me have more peace and sanity — plus made me feel like I have more time in my day. 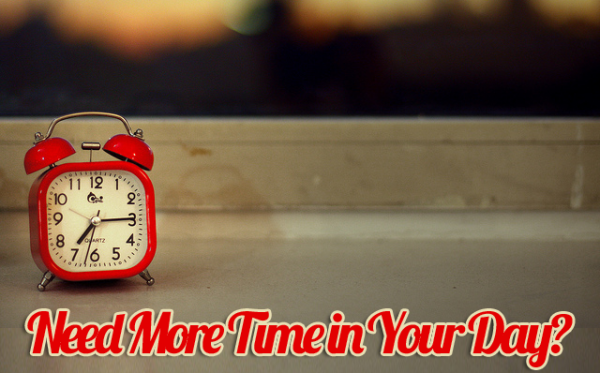 Looking for more time management tips? Be sure to check out my Time Management 101 series. I tried committing myself to this this past week. I failed, partially do to the fact I haven’t been sleeping very well and partially because out of the blue my son has rearranged he sleep schedule to waking up an hour before he usually does…. Sigh :0( maybe next week! I wouldn’t be able to run if I didn’t get up by 4:15 or 4:45 every morning. It means I nap with my daughter to keep functioning but I think it all works out. The up side is when they become teenagers you don’t have to wake up so early to be awake before them. the down side is if I don’t do it at 5:30am it probably won’t get done that day. Whatever “it” is for the day. I’ve always gotten up 30 minutes before my children from the time they slept through the night. I mainly started doing it so that I could get my shower and get myself ready for the day in peace. I can’t imagine doing it any other way now. ‘Tis true! If I can get dressed and drink my tea before my kids are up, I feel so much better. If I also get my morning devotions in, my day is fabulous. I just tried running in the morning for the first time yesterday, and I will try again tomorrow. It’s tough to get up at 6am or earlier for me, but I’m trying really really hard lately. I know I’ll never get on the treadmill if I don’t do it in the morning while my husband is around to handle the kids! I wish I was a morning person, but I’m a night owl. I found that I do better doing things at night. I take my shower at night. I try to get all the bags ready for school/work at night. And when (not nearly enough) I exercise, I use my eliptical at night. Years ago, when I was selling Avon, working full-time, and had only three kids, I would pick one night a week to stay up until midnight and get caught up on things. This may not work for everybody, but it sure kept me organized. same here! I CAN do things in the morning, but I’m much more productive in the evening (i.e. late night). 😉 It works for us and I have no plans of changing it! However, I do agree that getting up even 15 minutes before the kids helps me to be more prepared for the day, even if all I get done is coffee and breakfast. 🙂 Chores in the morning before they get up are a RARE occasion around here though. 😉 BUT they are done before I go to bed that night!! Me too! I’ve never been an early riser. I use to routinely get up 30 or 45 minutes AFTER my kids (there were lots of reasons why). I was recently inspired by your 20 days to a more organized home to start getting up 15-30 minutes before them. It’s been really hard but the days I do, I really do feel like I get more done. And the days I don’t the morning slips away before I really seem to get much of anything done. Getting up earlier or staying up later to get caught up and ahead on projects worked very well for me when my children were “littles”. I tried this too for a few days last week and the week before. It was great! I still didn’t want to get out of bed, but I did feel like I got a lot more accomplished those days. For the past few days my munchkin has been getting her molars in so she hasn’t been sleeping very well and getting up earlier than she used to which makes for a very tired mama, but when her sleep schedule gets consistent I plan to try this again! I don’t hear anyone talking about their husband’s opinion on this. Maybe other people’s husbands don’t care when their wife gets up, but I’ve been told by mine that he wants me to stay in bed with him on weekdays until HE is ready to get up (usually about 6:45am). He likes the time we have together to just cuddle and sleep while we’re hitting the snooze button a few times. 🙂 He’s the night person, so this is important to him. I get up earlier than him on Sundays so I can have a shower before the kids get up (and on Saturdays when he likes to sleep in much later than the kids need to be up and eating breakfast), but otherwise, I’m submitting to his request of sleeping in. Hey, I’ll take it! I totally agree. I love getting up early. I almost always get up before the kids. It is a challenge some days to do it and to make sure I use that time productively. I allow time in my afternoon for a short nap if needed and although, I rarely use it for a nap, knowing it is there helps alot. I agree it sounds like a great idea. Currently though I have a 18 month old that is a terrible sleeper and is up often by 5:30am. I can’t even imagine dragging myself out of bed before her, when I’ve been up with her 5+ times during the night. Some day I hope to get more sleep in my life and have the day feel like it is going a lot more smoothly. My first child was like that. No one else around me really understood, because their children were on pretty regular sleep routines. No matter what we tried, no matter how consistent we were, he just could not sleep through the night. He would wake up anywhere from 3-7 times a night to be tucked back in, have water, or just have me sit beside his bed. It was a long, tiring, painful time and I was alone since no one else understood what I was going through. When he was 20 months his little sister was born, and honestly, there were days I thought I would die from sleep exhaustion. Then at about 3 years old, my son just figured sleep out. He started sleeping for four or five hours at a time, plus his little sister was a great sleeper by that point. Slowly he went up in time, and now he sleeps ten straight hours every night. Hang in there, it will get better, though I’m sure it doesn’t seem like it. We adopted a 17 month old from a tough situation, and she had been a preemie as well. I don’t know how I survived the whole sleep issue with multiple night wakings, and not going back to sleep and demanding to be carried etc through out the night, and then not napping in the day to top it off! By the grace of God, a book was recommended to me – Healthy Sleep Happy Baby by Dr. Weissbluff. Although we weren’t comfortable following the cry it out principle given the background of our child, his idea of putting them to bed early was miraculous! After slowly backing her bedtime up to 6:30 pm she began sleeping through the night and waking later in the morning (5:30 a.m., but later than before! ), and eventually sleeping for naps! I write this in case this book might be of help to you! I know just how hard it is not to sleep, on your day to days and your health! And, no I didn’t get up before her! I tried once she started sleeping in later, but she would wake up with the sound of the shower etc, and that was a blessing, as I needed to catch up sleep more desperately than I needed to be ahead on my day. It’s a season, some day you may be able to get up first, but take care of yourself! So true!! It really does set the tone for the entire day. Easier said than done some days, but it really does make all the difference in the world. This would be great if I didn’t pass out after the baby finally went to sleep and wasn’t awaken by my older child in the morning. Both of my children also think that I need to be with at least one of them at all times, and it’s very tiring. I have been doing this since January. I wake up about4:15, wake up our 3 month old, drink my coffee, check my favorite websites and nurse. It is a nice way to start the day. My husband is home 2 days a week and I love staying in bed with him, but if I do the whole morning is chaos. This morning I didn’t get up until 5:30 and 3 hours later I still feel like I haven’t caught up. Everyone should try this for at least a week. You will feel so accomplished. Crystal, I prefer posts where the content is on your page and I don’t need to open another page to read. I think this approach can work well, however, if there is additional information the author wishes to convey. Please consider avoiding “teaser” posts like this in the future in favor of posts with immediate content! Thanks so much for sharing your opinion. I always appreciate others’ input! Just to clarify, though: I’m a regular contributor to MomLifeToday.com so when I guest post for them (or elsewhere) I like to send you over to the blog I’m guest posting at to read the full post. I can’t post the full post here as the content is theirs’, not mine. Since so many people appreciate knowing when I’ve posted elsewhere, I plan to continue posting teasers to these types of posts (don’t worry! I usually only guest post on other blogs a few times per month so it’s a very small percentage of the posts I run) for those who would like to go read them. Thanks for always reading and responding to comments I make directly to you. You often bring up something new I hadn’t considered. Maybe one day this will work for me but right now my one year old shares our bed and he wakes up when I’m not there! Every now and again I’m able to sneak out of bed and he will sleep another 30min. It is really nice when it happens, but it is rare. I am not a YOUNG mom by any stretch of the imagination…but I am the mom of a young child. 🙂 I find I need to get up earlier than she does, but it’s okay if my tween and teen are already up. I used to try to do this. My children love being with me, which is wonderful, but it also means that as soon as I move to get up, they all get up. Getting up earlier does not give me any time alone. But I did find putting them down for quiet time earlier in the evening, gives me a few more hours!! I can see this being handy for moms who work outside the home too! At least, I think it could really help me. Absolutely! I know many of the moms of young children who read here are also work-outside-the-home moms so I was thinking of them as well as stay-at-home moms when writing this. From what I’ve seen, I always say that I think it’s a lot harder to be a mom of older children — because you’re dealing with much bigger issues than just who gets to play with the green legos. That said, I’ve also heard that older children tend to want to stay up late at night and talk, so getting up earlier might not be as feasible as it was when they are younger and going to bed earlier. That’s what I had in mind when I said that, but thanks for your comment so I could clear up that possible misunderstanding! I am so thankful to read this post today. I have been praying about how to manage my home when I have to go back to work full time after my maternity leave with my second child. This is just the encouragement I needed! I think this is a great tip for any mom whose children currently sleep through the night. It really does work. I can get so much more done if I get up before the kids, then if I try to stay up after they go to bed to do it, especially now that mine are older and stay up later. However, if you have little infants that don’t sleep through the night, then I would skip it and get your sleep, and try to make the most of nap time instead. LOVE this article and totally agree. I don’t want to be selfish, but if I don’t get up early and have a little “me” time before my 2.5 year old and 9 month old wake up, I feel like I’m behind all day and I’m just a regular crab! I’ve never thought of myself as a morning person, but I’ve come to love 5 am! Except for during pregnancy I’ve been getting up at 5 am for a few years. My baby is now 9 weeks old and I’ve just resumed by early morning wake up time. I’ve missed it so!!! I get up and read my bible in the quiet. Drink my coffee while it’s quiet. And quietly exercise on the elliptical. Then I take a shower and it’s still quiet. Notice a theme? 🙂 I also get to check my email, unload the dishwasher, get breakfast ready, etc. I love having quiet in the morning. It definitely sets the pace for the day, and gives me a calm start. I seem to have a child with mom-dar, though, because I can’t get up to use the bathroom without her hearing and waking up. Sometimes I will just lay in bed and read my Bible (being extra quiet), and that gives me the peace I need to start the day. Everyone has to do what works best for them! Crystal, this is completely true. I have wanted to tell you how your 4 weeks to organization inspired me to do this. Since I work and have no other adult in the home, I barely have time for the basics around the house, so I didn’t even try to do your assignments. BUT, God seems to work on me in themes, and between your posts suggesting getting up and taking the day head-on, and a few other choice posts on enjoying the “mess” of my children (Ann Voskamp, namely), I decided to start getting up earlier. I have NEVER been a morning person. I have ALWAYS given myself the barest minimum amount of time in the mornings. With three small kids, getting out of the house and off to work on time has been a challenge. So like a lightbulb – duh! – I decided instead of getting up at 6:30 and scrambling, I’d get up at 6:00 when my alarm first went off. I asked a friend to do it with me, but she poo-pooed the idea, so I went it alone. And it has worked! For three weeks now I’ve been getting up earlier, and it has been wonderful. I even had a schedule change at work and don’t have to be there until 9:00 now, but I’m sticking with my 6:00 wakeup time. My mornings are when I’m most productive, and now my house is cleaner, my laundry is folded and put away, I’ve even had time to grocery shop! I do my hair. I have cuddled with my kids and read books to them. Someday I may even find time to get back into couponing! It took me 30 years to figure it out, but it has been wonderful. I’ve gone from a ridiculously chaotic single-working-parent life to finding some calm in the storm, just from getting up 30 minutes earlier. Thanks for helping me along the journey towards some peace. I’m taking baby steps and this was the first one. I would do this if I could, but past experience has taught me that if I get up earlier, my 4 yr old hears me and gets up earlier too. Any ideas for that?